It was a chilly Wednesday evening 5 days before Christmas. A group of women gathered together to celebrate the season and reconnect with our bodies and souls. It was such a beautiful way to head into the Christmas weekend, acknowledging and celebrating the darkness that comes before the light. The space was so inviting. Twinkling white lights lit the front of the family room at Glendale Presbyterian Church, winding around the fireplace and evergreen Christmas tree. There was a beautiful table of tea and cookies for everyone to enjoy. There were bottles of essential oils at the front of the space for us to sample based on our mood and how we were feeling that night. We set up our mats, blankets and other comfortable items and props to prepare for the gentle and loving yoga practice that awaited us. The practice was beautiful. We moved our bodies freely and were reminded of the true meaning and significance of the Christmas holiday. Cissy’s gentle voice and presence encouraged to take things at our own pace and modify any of the poses as needed. There were even cues to insert our own postures, go with the flow and honor whatever our bodies were seeking in the moment. I felt so grounded and relaxed after this event, and also excited and eager for the magic of the Christmas holiday to come. 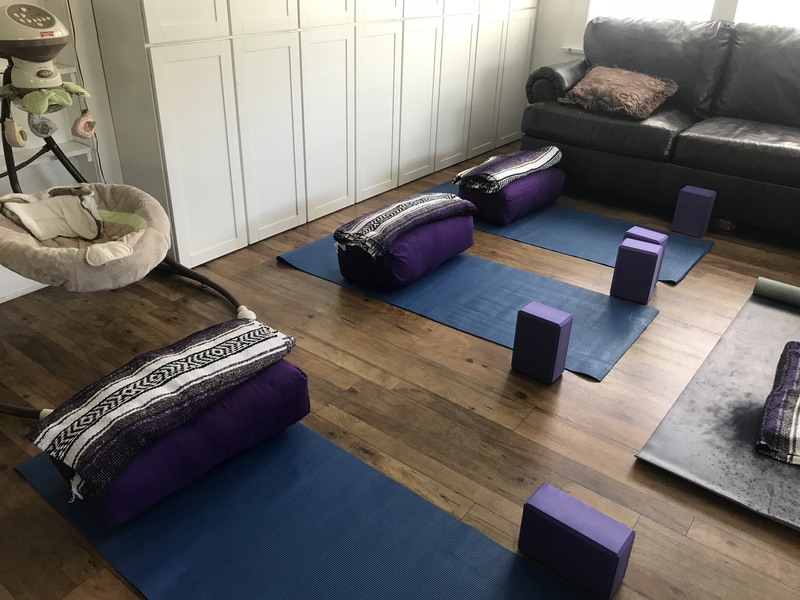 For me, the most wonderful outcome of this event came the next morning, when I found out that we had raised enough money to help purchase yoga props for the mamas to be at Elizabeth House. Elizabeth House is a non-profit, residential shelter program in Pasadena for adult women who are pregnant, have small children and lack adequate shelter and prenatal care. I volunteer every week to teach a prenatal yoga class to these amazing women. Thanks to the generosity of those who attended the Winter Solstice Yoga Workshop, we now have the props to keep the mamas at Elizabeth House safe and comfortable in their poses. My heart is so full of gratitude for the Alive and Well Women community, and it was incredible to see two organizations so close to my heart come together in this way. At the end of the day, this is why we do what we do and I’m honored to be part of helping women support women. Please consider joining us for one of our next events. The Contemplative Path to Health and Well-being, a two-month program, begins on February 9, 2018. Our Spring Equinox Drum Circle is on March 23, 2018. Please learn more about both events and register here. Kelly is a licensed mental health counselor and yoga instructor. Her passion is helping others to thrive, live their best life and find self-acceptance and peace through yoga and positive psychology. Kelly works with organizations that promote positive body image including The Body Positive in Berkeley and Alive and Well Women in Pasadena. She lived in New York, NY and Portland, OR before relocating to Los Angeles with her husband in 2016. Kelly spends most of her time teaching yoga classes around LA and finding ways to nurture her creative spirit. When Kelly isn’t teaching or practicing yoga, you’ll probably find her on an outdoor adventure with her husband, Steve. > Check out Kelly's website and blog.